Can Above Ground Pools Be Put on Concrete? Posted on February 7, 2019 February 4, 2019 , in Above Ground Pools. When installing a new above ground pool, having a level area on which to place it is imperative. It’s very possible to install above ground swimming pools directly on the ground as long as the ground has been properly leveled. In some areas of the country, this is more easily done than in others. It all depends on the composition of the soil in your area. For those who have extremely rocky or solid ground, getting things leveled out properly may require a lot of work. For this reason, some people ask, “Can above ground pools be put on concrete?” In fact, it is possible to lay a concrete pad onto which a pool can be installed, although it may be considered by some to be expensive. 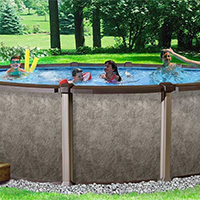 This article will go over some advantages of having a concrete base for an above ground pool. As mentioned in the introduction, if your ground is extremely rocky or solid, it may take a lot of hard work to get it properly leveled. Installing a concrete pad will automatically remove this barrier to flatness. But even for people with easily worked soil, getting a good levelling job done on soil takes both a lot of experience and a person with somewhat of an obsessive/compulsive personality. Installing a concrete pad will be quicker and closer to perfection. When you place an above ground pool on soil, any leaking water can cause the soil to wash away. This will create soft spots in your pool’s floor which can make it harder to clean and easier to puncture the liner. If you’ve installed a concrete pad you won’t have to worry about it washing away due to minor leaks or heavy rainfall. If you install your above ground pool on soil, there’s the possibility that the ground will shift beneath the pool. Depending on your location you might also run into problems with rodents such as moles or insects such as ants that can cause the ground to shift. All this movement of the earth spells problems for the bottom of your pool. By installing a concrete pad you’ll lower, if not completely eliminate, the possibility of this kind of earth shifting. It may seem impossible that weeds could grow underneath your swimming pool, but the fact is that they do, and they can cause a lot of problems. Weeds such as sedges and nutgrasses can grow through pool liners, tarps, and pads and cause leaking and buckling. By laying a concrete pad you’ll ensure these weeds are unable to break through and compromise the bottom of your pool. To learn more about our above ground pools, download a brochure.